On the evidence of Bayern Munich's edge-of-the-seat Supercup triumph over Borussia Dortmund, fans worldwide can expect another barnstorming season of Bundesliga football in the months ahead. Is there a more exciting player in world football than USMNT international Pulisic? The Dortmund attacking midfielder rose to the occasion at the Signal Iduna Park, ruthlessly pouncing on a mistake by Bayern's Javi Martinez before slotting away the opening goal with the confidence of a seasoned pro. The youngest scorer in Supercup history (18 years and 322 days) once again underlined his big-game bottle after a couple of star turns last season in the 4-0 UEFA Champions League win over Benfica and the DFB Cup final success against Eintracht Frankfurt - and can expect to have a big say in BVB's quest for silverware in 2017/18. 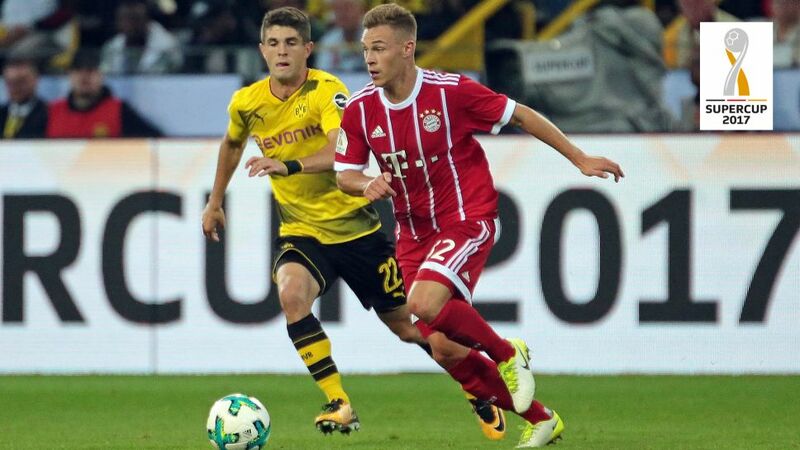 Another young Bundesliga star in the ascendant, Bayern's Joshua Kimmich did the retired Philipp Lahm proud at right-back. As well as going toe-to-toe with Pulisic and Co., the freshly minted FIFA 2017 Confederations Cup winner was a thorn in the side of makeshift BVB left-back Dan-Axel Zagadou and, after chipping in with the assist for Robert Lewandowki's first-half equaliser, instigated Bayern's game-saving effort - a Lukasz Piszczek own goal - at the death. The 22-year-old fluffed his lines in the ensuing the shoot-out, but make no mistake: Lahm Mk.II is here to stay. Even with the likes of Kimmich and Lewandowski on the team sheet, Bayern's starting line-up was some way off what many would regard as full strength. First-choice goalkeeper Manuel Neuer, Germany centre-back Jerome Boateng, Austrian all-rounder David Alaba, midfield matador Thiago, winger Arjen Robben and summer signing James Rodriguez all missed the Supercup – but still the champions got the job done. Bad news for their aspiring pursuers. Although Dortmund fell short in the Bundesliga season's traditional curtain raiser, Peter Bosz's revamped BVB did enough to suggest they will give Bayern a serious run for their money in 2017/18. New boys Zagadou, Mahmoud Dahoud and Maximilian Philipp all featured, but Pulisic, Ousmane Dembele and Pierre-Emerick Aubameyang inflicted most of the damage. Holding on to the budding magische Dreieck (magic triangle) could yet prove the Ruhr district club's best bit of business of the summer window. The story might have had a happier ending for Dortmund were it not for the premiere of Video Assist technology. Both Kimmich and Lewandowski looked to have been offside for Bayern's 18th-minute leveller, but referee Felix Zwayer checked with his Video Assist and the goal stood without the need for a televisual review. The German Football League and German Football Association promised the new piece of kit would deliver "minimum interference, maximum benefit," and it didn't disappoint. Click here to relive the Supercup 2017 as it happened!